The FN Five-seveN® autoloading pistol was originally developed as the sidearm component of the integrated 5.7x28 mm System for allied forces. Today it is the sibling firearm to the FN P90®/ PS90® bullpup carbines. 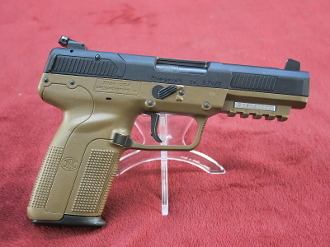 The polymer-framed FN Five-seveN® offers single-action operation and is chambered in 5.7x28 mm producing low felt recoil. The barrel is cold hammer-forged and chrome-lined for extended service life. It comes standard with a 20-round magazine and is equipped with ambidextrous, forward-mounted manual safety levers and an accessory rail that accepts tactical lights and lasers. The FN Five-seveN® single-action autoloading pistol fires the low-recoil 5.7x28mm cartridge making it ideal for personal protection, target shooting or NRA Tactical Police Competition. It features a textured, ergonomic polymer frame with checkered panels for enhanced grip. The polymer slide cover helps reduce weight and the operating controls allow for easy access with a reversible magazine release and ambidextrous manual safety levers. The barrel is hammer-forged and chrome-lined for enhanced accuracy and extended service life. Models are available with matte black, olive drab green or Flat Dark Earth frames with a choice of adjustable target sights or fixed three-dot combat sights.